What if New Sink Drain Does Not Line Up With Existing Pipes? To complete the path from faucet to sewer, your new sink drain must line up with the sink basin's outlet, called a "strainer," and the main drain's inlet. The distances between these components vary from sink to sink, so manufacturers make drain assembly components easy to adjust and modify. In general, you can adjust the length and height of drainpipes by cutting them or simply slipping them in and out of their fittings. 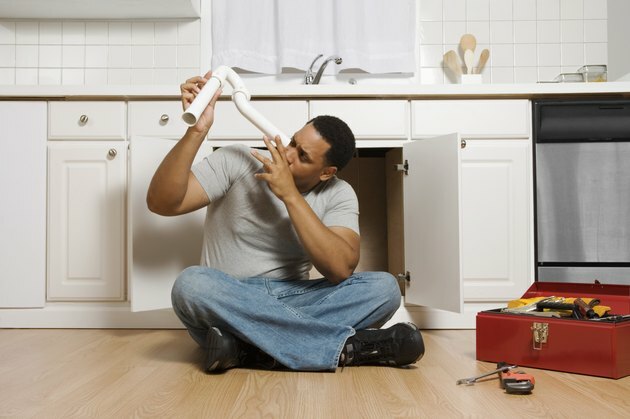 Alternatively, extension pipes and specialty pieces allow you to modify the design of your under-sink drain assembly. Cutting a P-trap's extension pipe adjusts the trap's horizontal position. Conventional sink drains generally consist of three parts: tailpiece, P-trap and extension pipe. Tailpiece pipe runs between the sink and the P-trap and extension pipes run between the P-trap and main drain inlet. In most double-basin sink installations, the basins' separate tailpieces join before they enter a shared P-trap. Garbage disposal units connect directly to the underside of sink basins and occupy the same position as tailpiece pipes. Dishwasher drain hoses either enter the side of a specially designed tailpiece, called a branch tailpiece, or connect to an inlet on the side of a garbage disposal. If the extension pipe that runs from the P-trap to the main wall drain is higher or lower than the main wall drain inlet, you must adjust the vertical orientation of the drain assembly. The simplest way to adjust the drain assembly's vertical position is the increase or reduce the length of the tailpiece pipe. If you reduce the length of the tailpiece by cutting, you will raise the extensions pipe's vertical position. If you increase the length of the tailpiece by adding tailpiece extensions, you will lower the extension pipe's vertical position. Standard P-traps consist of two curved pipes that swivel around a threaded connection, usually called a union. If you loosen the P-traps union nut, you can twist the lower portion of the P-trap to align the attached extension pipe with the main wall drain. However, in some circumstances, simply twisting the trap might not align the extension pip with the wall drain inlet. If twisting the P-trap still doesn't align your extension pipe with the wall drain, you can attach fittings or flexible drain extensions to the extension pipe. Conventional sink drain components are thin-walled metal or plastic pipes. You can cut both metal and plastic sink drain components with a hack saw. It's important to cut straight across the pipe's circumference, so the pipe seats flush within adjacent components. Standard drain assemblies connect with slip-joint nuts and washers. Slip-joint fittings create waterproof seals without glue or soldering. Also, most manufacturers advise against tightening slip-joint components with wrenches or pliers. Tighten the nuts by hand.